Do you want to become a Rehab Expert but don’t know how to operate an electric screwdriver? As crazy as it may sound you don’t need to be a handy person to be a rehabber. Sure, it is a help but far from a prerequisite in getting started. There are many rehabbers all over the country who got their start without knowing the first thing about home improvement. They gained their skills and experience from every project they were on until they knew enough to run a project on their own. Conversely, most handy people think they know the process well enough to dive right into the world of rehab. What they find is that it takes more than the handy person knowledge to be successful. Regardless if you can operate a SAWZALL or don’t know how to swing a hammer the rehab side of the business is open to everyone. Here are four things you need to do to be a successful rehabber without tool belt experience. Know The Process. Instead of being an expert on the technical side of things you should start by knowing the process. You don’t need to know anything about home improvement to master the steps of a rehab. While every rehab has their own unique qualities there are similar several steps with every property. You should have an understanding on the big items to look for that are costly and difficult to deal with. Roofs, issues with the structure, windows and electrical items will have a much bigger impact than simple cosmetics. You don’t need to know how to remedy these problems but you should have an idea of the costs. One way to learn the costs is by simply walking around big box retail stores. This will give you some background on the cost of materials and with a few questions what they may be used for. Cost of labor you will learn the more job sites you are on and the more contractors and project managers you talk to. This knowledge will come in time but knowledge of the process is something you can learn before getting started. Surround Yourself With A Strong Team.If you don’t know what you are doing on a rehab there is a real possibility you can and probably will lose money. Instead of waiting until you master every aspect of the process you can get started by surrounding yourself with a strong team. Start by finding the best contractor you can find. This may not be easy as many contractors only like to work with experienced investors. However, if you reach out to enough you will eventually find one that is a good fit for you and your experience. While you don’t want to blindly give your contractor the keys to a rehab project you should be willing to let them run things the way they see fit. You can certainly get different quotes but let your contractor run the project. In addition to your contractor you should also find a quality project manager, electrician, plumber, drywall expert and painter. Generally speaking, you should try to get at least three quotes on every aspect of the property. This is your rehab but you can make it easy on yourself by having the best possible team around you. Consider A Partner.If the prospect of talking to people in the trades is difficult without knowing the jargon you can consider taking on a business partner. With a business partner you can handle the financial side of the transaction while your partner runs the rehab project. The upside is that you can feel comfortable knowing that your partner will not get run over by a contractor or handy person. The obvious downside is that you will not make as much on every deal as you expect. As you are just getting going this can be a great way to learn the business without the stress of trying to do everything on your own. You can hang around the property in your free time and see how things are done without everyone turning to you with questions or problems. Your partner will be the buffer and deal with any issues that pop up. A partner may limit your upside on every deal but it can be a great way to learn the ropes and break into the business. Defer-In real estate it is always best to know what you don’t know. There are many investors who try to fake like they are an expert only to have it come back to haunt them. There is nothing wrong with saying that you don’t know a particular aspect of the business. With rehabbing if you don’t know what you are doing you will eventually get exposed. You are far better off deferring to the people around you as you develop your education. As we mentioned you should seek out a good team or a business partner until you are comfortable with the process. You will still reap the rewards of the deal, maybe not as much, but in the end it will be worth it for you. There is nothing wrong with deferring to the people around you for your first several rehabs. 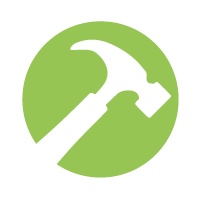 Some of the best rehabbers got their start without knowing how to swing a hammer. It may be uncomfortable during your first few deals but eventually you will find your way. You can do anything you put your mind to! Don’t give up before you’ve began, YOU CAN DO THIS!!!! !